The Fellowship was fortunate enough to obtain a copy of BRAVEST WARRIORS #2 from KaBOOM Studios. The stories are by Joey Comeau and Ryan Pequin with art by Mike Holmes and Pequin. The colors are by Zack Sterling and Studio Parlapa. BRAVEST WARRIORS was created by Pendleton Ward. The team is sent to help a planet populated by clowns. The problem is Danny is very afraid of them. Beth may have a solution, but it could be even worse than the phobia! The Warriors must also deal with ancient nameless one that has been following them for a period of time. The Warriors eventually arrive and must get prepared to battle the clowns’ greatest enemy…SADNESS! But who or what is sadness and are our heroes up to the task? In back up story “Space Flu,” Chris gets sick during a mission to save a village. The illness quickly spreads to the rest of the Warriors. Are the heroes able to battle the village’s threat and the space flu at the same time? What a crazy, odd, yet fun comic to read! The humor is great (nice little Pinky and the Brain reference) and it’s a little out there, not that it’s a bad thing. Anybody can read this and can mostly understand the characters and situations without no prior knowledge. 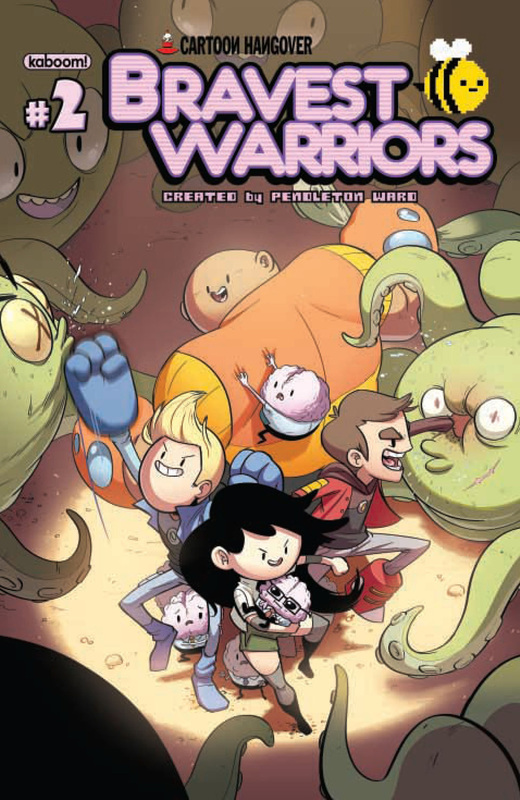 BRAVEST WARRIORS #2 is in stores now and available at www.kaboom-studios.com.